For more a millennium the policy we know as Arakan existed as a culturally strategic border state, the only state in Southeast Asia to be connected to India by both land and sea routes. The study of its culture is of particular interest as it reveals which elements of Indian cultural were adopted in Arakan and in the land to its east. We can then ask why some elements and not others were adopted, and attempted to relate this to the political, social and religious developments of the wider region. In the periods when Arakan was at its most powerful the most important cultural influences came from the west, most immediately from the area today known as Bangladesh. When the Burmese and Mon kingdoms to the east prospered, and from time to time gained sovereignty over Arakan, the major influences came from there. Positioned as it was on the sea route around the Bay of Bengal, Arakan was also subjected to the influence of the cultures of southern and western India, and in particular to Sri Lanka, which as the most important Buddhist polity in the region has a significant impact on the religious development of the state. From the earliest urban sites we have the seal of the south Indian merchant dating to around the third century AD and an intaglio which appears to have originated in the middle east of the same period. The archaeological remains are limited in what they can tell us, but the art and architecture which survives today suggests that the impetus for the adaptation of Indian and other influences was power. As contact with the wider region increased in the early centuries of the first millennium AD the economy diversified, urban centres developed and a more complex social structure developed. The ruler was invested, through Indian Brahmanic ritual, with superhuman qualities through which the fertility and therefore the prosperity of the state were not introduced, the caste system, for instance, although a fluid sort of class system. Not as dependent on birth as in India, did evolve. It is also the site of one of the most famous Buddhist shrines in Southeast Asia, the Mahamuni. It is here, legend has it, that the Buddha himself came and allowed a statue to be made in his own image. The object of veneration for centuries, the image was seen as the palladium of the state and coveted by the kings of neighbouring countries. The earliest site known to us is the walled and moated city of Dinnyawadi, "Grain-blessed". This is possibly the site of a pre-Indian cult of the earth goddess, and lying on the route from the hills to the sea would have been a trading centre. It is also the site of one of the most famous Buddhist shrines in Southeast Asia, the Mahamuni. It is here, legend has it, that the Buddha himself came and allowed a statue to be made in his own image. The object of veneration for centuries, the image was seen as the palladium of the state and coveted by the kings of neighbouring countries. While the legend as we know it probably dates from a time later than the building of the shrine, the images which survive suggest that the earliest form of Buddhism was Mahayanist, for we can identify bodhisattvas, guardians of the directions and other images which relate, surprisingly, to the Buddhism practised in China at the time. The style, however, is closely connected with the Gupta, although there are no direct connections with any Indian schools. It is possible that the sculptors used Indian texts, from which they made their own interpretation of the iconography. Sometime around the sixth century the centre of power moved to Vesali, where we find evidence of a Brahmanised royal cult, in the form of a massive recumbent bull discovered in the centre of a brick structure used for royal ritual. The bull also appears on the obverse of a series of coins, together with the name of the king in Sankrit. On the reverse of the coins is a motif known as the srivatsa, symbolising the king's function to guarantee the prosperity of the land. This symbol is also found on coins from the same period elsewhere in Burma and in Thailand and south Vietnam, indicating a shared culture which, as Robert Brown indicates in his paper, must have existed in mainland Southeast Asia until the seventh century. The architecture of this period also has strong links with the countries further east. Two lintels in the style known as Sambor Prei Kuk, from the seventh century site in Cambodia, architecture fragments indicate contact with central and southern India. Also found at Vesali are a great number of Vishnu images, indicating that his worship was widespread from perhaps the sixth to at least the ninth centuries. Vishnu was known too at the Pyu sites in central Burma. The iconography of the Arakanese examples is closely related to that of east Bengal at the time. There is evidence, too, of a popular form of Buddhism, with images inscribed in Sanskrit. After a period of turmoil, probably the result of the coming of Tibeto-Burmans to Arakan from the north, Vesali was succeeded by a serious of smaller cities which came under the sovereignty of Pagan. The Buddhist art of the 11th and 12th centuries is strongly influenced by pagan, as can be seen by Buddha image in stucco, and a rare Vishnu and Laksmi from this period follows the heavy physiognomy of the late Pagan period. As the power of Pagan waned, however, Arakan was able to expand its authority to Bengal in the west and to Cape Nagrais in the south. By the beginning of the 15th century the Burmese invaded and the Arakanese king fled to the Sultanate of Gaur in east Bengal. He returned, with the assistance of the Sultan, to found the last of the great cities, Mrauk-U. 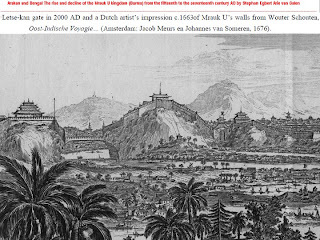 Mrauk-U at the height of its power controlled Bengal up to Dacca and Pegu in the Mon country to the south. The great originality of its art was in its architecture. Its builders used a technique of facing a brick core with stone slabs bound by mortar, and made extensive use of dark gray sandstone brought upriver from the coast. This use of stone was the great difference between the architecture of Arakan and that of Pagan and Bengal, where stone was scarcer. Mrauk-U at the height of its power controlled Bengal up to Dacca and Pegu in the Mon country to the south. The great originality of its art was in its architecture. Its builders used a technique of facing a brick core with stone slabs bound by mortar, and made extensive use of dark gray sandstone brought upriver from the coast. This use of stone was the great difference between the architecture of Arakan and that of Pagan and Bengal, where stone was scarcer. The architects combined the lessons of Pagan with the Muslim experience in building arches, domes and vaults, in which mortar played the dominant part of keeping the masonry together. They were thus able to conceive massive hollow pagodas, whose central shrines were entered through long vaulted passages. The Shitthaung shrine, built be King Mong Ben after he conquered Bengal in 1536, was the magnificent statement of a cakravartin Buddhist king who had conquered Islam. An arched screen on the western side and the arrangement of stupas on the roof recall the mosque architecture of 16th century Gaur in east Bengal. Surrounding the central image are circumambulatory passages, on the outer of which the king is depicted as a god with the attributes of a cakravatin king, some derived from the iconography of Vishnu the Preserver. He is flanked by his Bengali and Arakanese wives, distinguished by their dress, and by depictions of his power and the prosperity he has brought to his country. Other Mrauk-U shrines are decorated with glazed tiles, some decorated with middle eastern motifs, others have reliefs depicting the three worlds of Buddhism, some are guarded by figures reminiscent of the 5th-6th century images founded at the Mahamuni shrine. The sculpture of the period is similarly diverse. Crowned Buddha images are derived from the style of the late Ming, seated Buddhas from the art of northern Thailand. Some extraordinary Sri Lankan bronzes have been discovered, recalling the time when the Dutch rulers of Sri Lanka, wanting to overcome the influence of Catholicism brought there by the Portuguese, sent to Arakan for monks to perform the Buddhist ordination ceremony to purify the religion. Gradually, however, the power of Mrauk-U waned. In its last century Arakan survived only because it had no aggressive neighbour. In 1784 it was conquered by the Burmese ruler Bodawpaya and the revered Mahamuni image was taken to Mandalay. With its loss, the Arakanese people seemed to lose heart, and its shrines and images were largely neglected for the next 200 years. it is only recently, with the emergence of Mrauk-U as a tourist destination, that the Burmese government has begun to restore some of the monuments. Ausheritage is in the process of bringing together a group of experts to assist in the restoration, and I hope that TAASA members will be able to participate in various ways. I would like to thank U Kyaw Kyaw Hla, Chairman of the Trustees of Shitthaung pagoda; U Kyaw Htun Aung, Assistant Director. Archaeological Department; U Aung Kyaw Zan of Mrauk-U Travels and Tours and photographer Zaw Min Yu.